Barbecued Wings are always a great option for game day, just select your favorite BBQ sauce and you’re ready to grill up some chicken wing ‘cue! Now, what we like to do is pair a good BBQ rub with the sauce. You can use any rub that you like – again just pick a favorite, or even something new, sprinkle liberally over your raw wings before grilling or frying. Now you’ve kicked up those wings quite a bit along with your tangy, smoky sauce. But it gets even better when you have a barbecue rub AND barbecue sauce that were just made for each other. 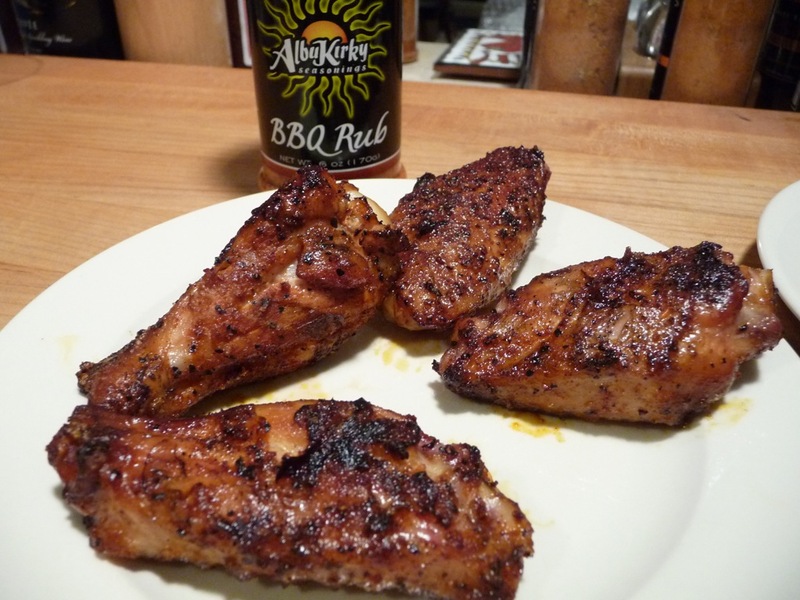 And that is just the case here with AlburKirkySeasonings.com ‘s AlburKirky BBQ Rub and BBQ sauce. 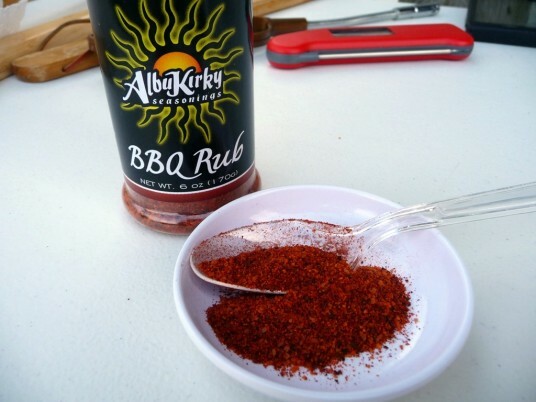 Kirk Muncrief of Albuquerque, New Mexico created his rub and sauce to go perfectly with each other, each complimenting the other. AlbuKirky (get it? And it’s SO much easier to spell) BBQ Rub is made with New Mexican Chiles that bring a “truly unique flavor with a little kick” to their rub, and AlbuKirky BBQ Sauce, also made with New Mexican Chiles, really brings a great Southwest flavor to barbecue. 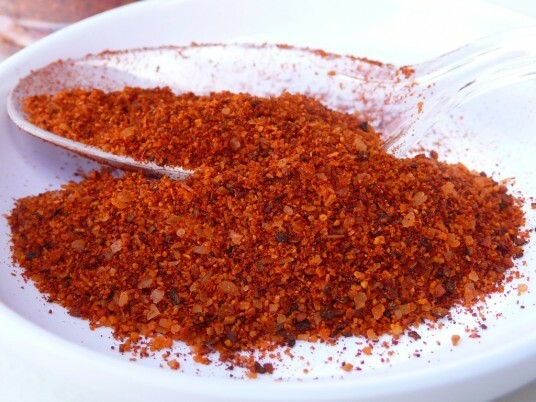 This rub does begin with kosher salt, so that is a very dominant flavor up front, but it’s tempered by the spicy heat from the New Mexican chiles and the garlic. Straight out of the bottle, you are going to taste that salt, but we found it “cooks out” and after grilling the wings, the rub had more of a sweet, spicy, chile flavor. The heat also holds up well after cooking. … or a beautiful rub is a good thing! Look at that nice texture, and how even the kosher salt flakes have taken on the bright red color from the authentic New Mexican chiles. [click on the pic for a bigger view… go ahead, I’ll wait…] See what I mean? Heat Level: – mildly spicy, but brings a nice Southwestern flavor to the back of the throat – doen’t burn the lips or tongue. It’s more of a deep, smoky, flavor that to me, is slightly reminiscent of roasted chiles. Pleasant and satisfying. We sprinkled some of the rub on our wings, both for the dry rubbed and the BBQ sauce pieces. For the dry rubbed version, we tossed those rubbed wings into a baggie, added just a bit of olive oil (about 1/8 cup for the dozen wings), and let them get all happy in the ‘fridge for a few hours (or overnight). The wings destined to be slathered in the BBQ sauce were also placed in a baggie and waited in the ‘fridge until the dry rubbed ones were ready to grill or fry. 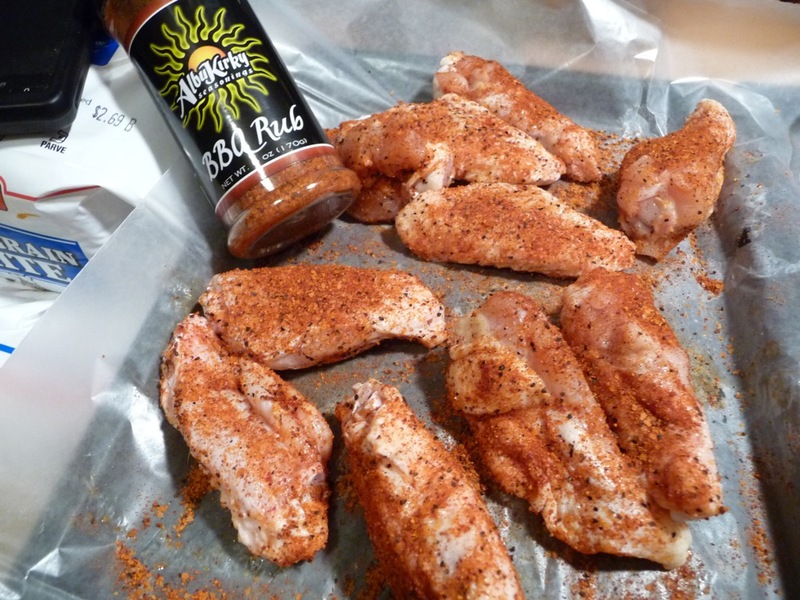 During and after grilling these wings, a little more of the rub was sprinkled on them. They turned out beautifully. Overall rating: – savory, spicy, and delicious. Works perfectly supporting the BBQ sauce. 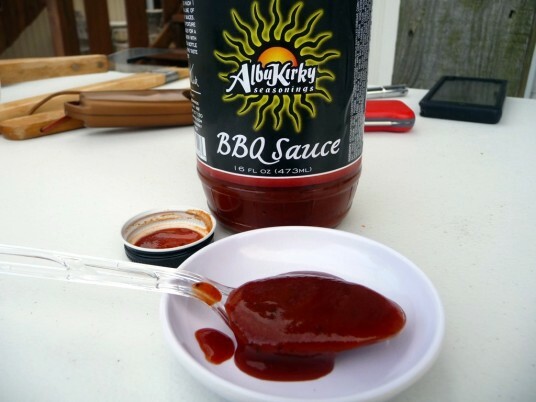 AlbuKirky BBQ Sauce was Kirk’s creation to go well with his BBQ rub, and I think he came up with a simple, yet flavorful sauce that is good on its own too. The AlbuKirky BBQ sauce is of a light-medium thickness and fairly smooth texture. This is not your chunky BBQ sauce. It does offer up a big peppery smell. And like a lot of really good BBQ sauces, it may not taste “at its best” straight out of the bottle. Good sauces like this need to be heated up and cooked with. 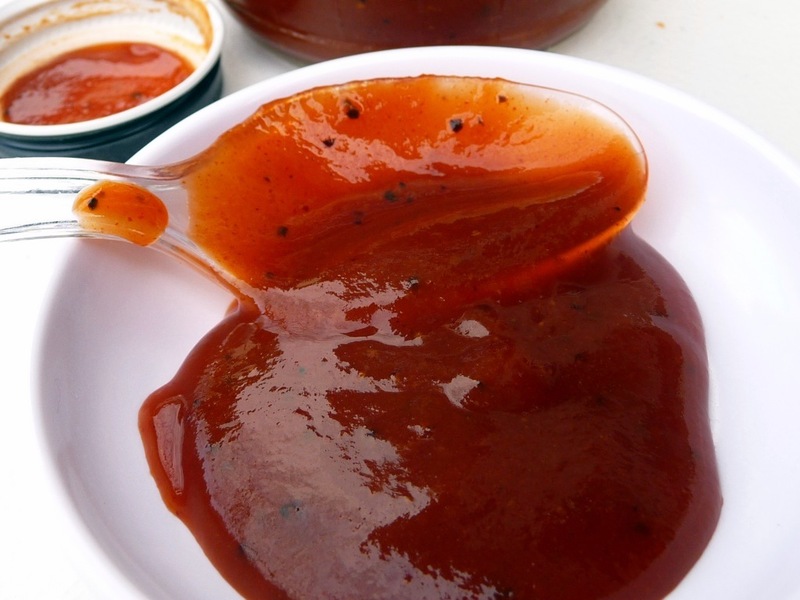 With only 11 basic ingredients, tomato ketchup being the first, the overall profile does lean towards the tomato and vinegar realm – the taste is of a classic BBQ sauce. I taste a dark flavor, with a nice amount of sweetness from the molasses and brown sugar. Finally, it has a zing from the yellow mustard and vinegar. And the spices bring on that Southwest flavor that makes this sauce unique. It reminds me of a classic roadside BBQ sauce like you see at corners in the summer – open pit BBQ chicken sold by churches, fire departments, VFW’s and the like. All I know about roadside BBQ chicken is what we have here in Maryland. This is that good, with the added flavor profile of the Southwest New Mexican chiles – which I assume are in the “spices”. 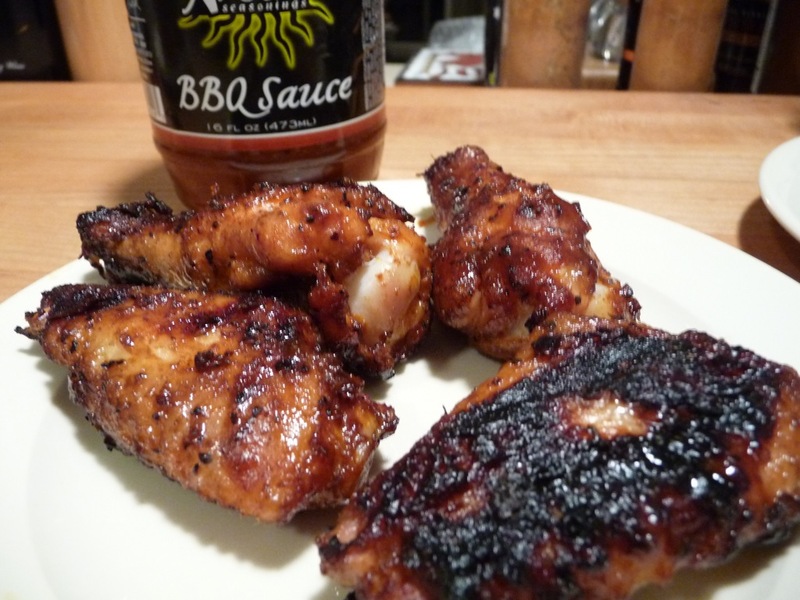 The sauce cooked on the wing nicely, caramelizing well and holding its body and cling. A great depth of flavor with a mild amount of heat – a little on the zippy side. Overall Taste: – What brings it home for me is the roadside, smoky spiciness and that wonderful New Mexican Chile flavor. AlbuKirky took a pretty good, basic BBQ sauce and made it their own. 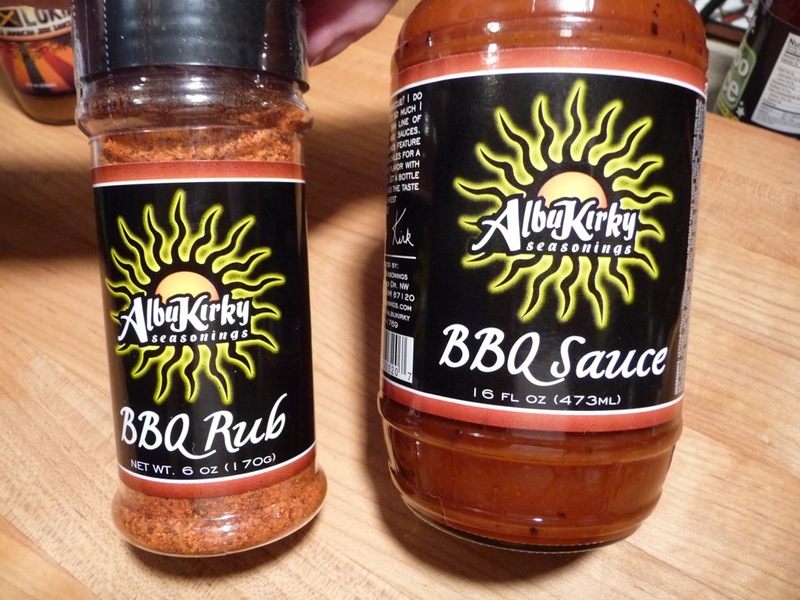 You can purchase these at AlbuKirkySeasonings.com and be sure and check out Kirk’s newest rub, the AlbuKirky Green Chile Rub. And be sure and check out Kirk’s Blog at AlbuKirky.Blogspot.com where, as an accomplished grill man, he shares recipes, tips, and videos. Our Week of Wings III was interrupted by our ZestFest2012 reports… and just life in general. Sorry for the delay, but we’re proud to be featuring AlbuKirky as our BBQ wing of choice for this year’s WoW. This was a great surprise, thank you so much the positive review. Your expert opinion means a lot to me. I’m happy that you enjoyed the sauce and rub. Gorgeous looking wings! I bet Kirk’s rub and sauce gave it a nice Southwestern flavor. Even though I’m not a huge fan of dry-rubbed wings, these were wonderful… not too salty, nice savory flavor, with a bit of kick. I enjoyed the rubbed and sauced wings the most though :-), a little sticky, a little sweet, with a hint of heat. Awesome! I’m a big fan of Kirk’s products. His and Draper’s were my favorite last year and ironically, both have rubs that pair well with the sauce. I just used Kirks in the Asian mini tacos I did this week. And I found Kirk and his rub from YOU Chris. Hope you don’t mind, I edited your comment to add the link to your delicious looking Mini Asian Tacos! Tamarind, soy, chicken in won ton wrappers? Oh yes!